Our Santa Rosa Tile stencil design is a beautiful classic tile pattern, reminiscent of the past. It was inspired by antique Spanish and Portuguese tile patterns that are so popular today. 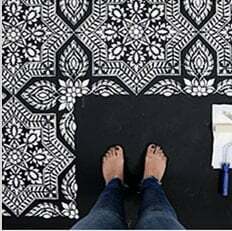 Our tile stencils look great on walls, kitchen backsplashes or anywhere you would use cement floor tiles. Our tile stencil designs are super easy to use and provide big savings to more expensive alternatives of wallpaper and floor tiles. Get a Pinterest-worthy tile floor for a fraction of the price of real cement tile!